…why didn’t / doesn’t the government just set up a public REIT and take out-right ownership in the houses??? Put another way, there is ‘closet’ socialized risk in backing the validity of the mortgages in the first place, where the spurious belief is that free markets are therein left alone to work. Yet moral hazard has already taken its toll. That’s why I pose the question: why not just claim the ownership (and risk); protect the nation from future liability matching schemes; keep the national balance sheet in some kind of order (that is actually on the balance sheet); and technically improve the supply-demand dynamics? Keynesian’s would love that policy because that is as direct as federal intervention gets! Plus the government would effectively be able to regulate and administer the benefits to society with genuine accountability. The bid-ask spreads are most revealing: what a willing buyer and seller come to terms on with prices, ignoring all commissions. Generally speaking, narrow(ing) spreads equate to efficient, liquid market environments. Liquid and efficient markets foster trust, faith and stability. Today’s housing market has spreads that easily exceed 10-20-30%! It is not uncommon to purchase a home at discount prices of…well you know what I mean. So, let’s think about the concept here—a buyer’s market is not a seller’s market, and vice-versa. That is just another way of saying which of the two parties is facing more of the pressure to compress the bid-ask spread: will bids come down or asking prices go up? Today is more on the irrational side because of the psychological bias that sellers more notably are dealing with – denying what willing buyers are willing to pay. This is significant because as far as I see it, if spreads continue to remain as wide as they are…it justifies that the housing market needs more time to stabilize itself. Unfortunately, prices tend to stabilize in the downward direction more than upward (funny thought). Much of the dislocation comes as a function of the price-appreciation component of Total Return concept. If homes are perceived to no longer offer greater appreciation than the long-term rate of inflation, 3 percent per year, then that will definitely prove that the pressure should continue to be on sellers to narrow the spread. It is difficult to talk about housing from a national perspective given the dramatic differences in state demographics and sub-stratified marketplaces. 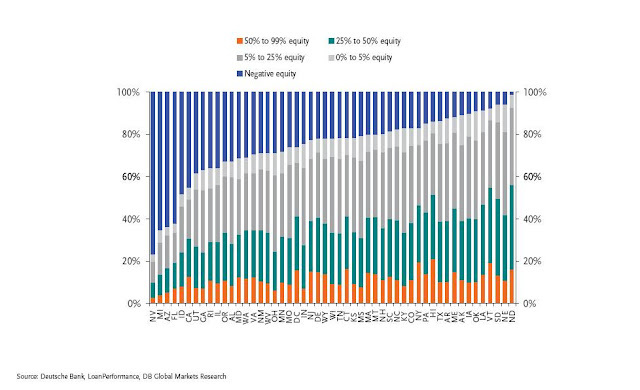 There is no clear trend or difference between states within the 50-99% home equity range; only a small (but still insignificant trend) with the 25-50% equity makeup. These statistics are like when political persons have to reveal their own net worth: very subjective still. How does this graph account for refinancing and in cases where home equity is tapped? Can’t tell from this, too many moving pieces-parts. Bill Gross, the legendary and infamous bond guru, and more recently anti-federal-intervention-activist, coined the term “Total Return” back in the early 80’s. He attached the name to his flagship fund: Pimco Total Return. - Price Return is dynamic, and where the waters become muddied. When you buy a business, you are acquiring its earnings power. You pay a premium for that—some type of multiple over operating earnings. You receive the dynamic price appreciation as the business increases raw earnings power, or alternatively, from a “multiple expansion,” which is a fancy way of saying: what someone is willing to pay for the business. Hopefully you can see how this can rather easily turn into a matter of opinion…this is what markets try to reconcile. - Income returns are “static” in that rates are locked in; like the background character in any screenplay, you know what you are getting. Knowing how much money you will collect is nice, and sometimes that is all one can ask for. However, thinking about the risks of inflation, credit, and all of those subtle and often unquantifiable threats can make this income return look not so great. I guess we will have to pick up this conversation…or better yet…use this theoretical backdrop in context. Because after all…people only care about real-life and the bottom line: Total Return.